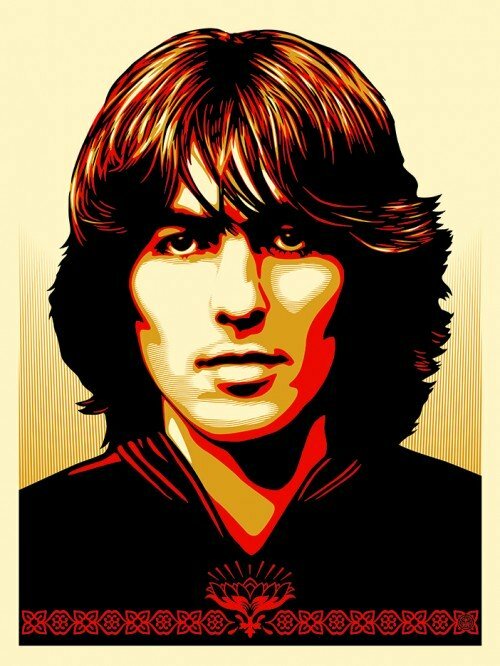 ORGAN THING: Shepard Fairey has just unveiled a new George Harrison portrait. “I was honored to be asked by Dhani and Olivia Harrison to work on a portrait poster to coincide with the major reissue of George Harrison’s first six solo albums, released between 1968 and 1975 on The Beatles’ Apple Records label, digitally remastered from the original analogue masters. The Apple Years 1968-75 will be available on CD and digitally on September 22. Designed to complement Harrison’s 2004 collection, The Dark Horse Years 1976-92, the new box features an exclusive DVD with several video pieces, including a new seven-minute film with previously unreleased footage. The Apple Years box also includes an exclusive perfect-bound book with an introduction by Dhani Harrison, new essays by award-winning radio producer and author Kevin Howlett, and rare and previously unpublished images”.